Chocolate Peanut Butter Explosion is perfect on those harried days that we all have from time to time. The ones where there just aren’t enough hours to accomplish all that we set out to do; let alone find extra hours to bake a time consuming recipe for dessert. Several years ago I experienced one of those days (not to worry, I’ve had all too many days just like it since.) The reason this particular day stands out is that from the insanity of those twenty four hours, came one of my most favorite, easy desserts: Chocolate Peanut Butter Explosion. It was only an hour before our company was due to arrive for dinner and I had not gotten around to dessert. Budge’s Brownies can always bail me out, but I wanted something more. I decided to bake the brownies in a 10” cake pan. Once it was out of the oven, I topped it with chopped up Reese’s Peanut Butter Cups. Joshua wandered into the kitchen around that time and suggested topping the peanut butter cups with a chocolate ganache drizzle. That boy sure is smart! The end result is a warm, gooey, decadent dessert that a friend summed up with one word, “Crazy.” Because all three layers are still toasty from the oven, each bite melts into itself. It is as though a giant peanut butter cup has simply, “Exploded” into a heavenly treat. I am hard pressed to find a simpler, yet more delicious treat. Best of all, when serving Chocolate Peanut Butter Explosion, people think that I have been slaving away for hours to prepare it. Do I bother to correct them? Nah, I can’t think of a good enough reason to do so. Can you? Preheat the oven to 300º. Grease a 10” round cake pan. Line with parchment paper and set aside. Melt the butter and chocolate together. Set aside. Combine the flour and baking powder. Set aside. In a large mixing bowl slightly beat the eggs with salt. Add the sugar and mix on low speed. Alternately add ½ of the chocolate mixture and then ½ of the flour mixture until all is mixed in. Add the vanilla. Pour the batter into the prepared pan and bake 40 minutes at 300º. Cool the cake for 10 minutes in the pan on a cooling rack. Turn off the oven. Chop the peanut butter cups and set aside. Combine the semi-sweet chocolate with the cream and microwave until melted. Stir until smooth. Place the chocolate topping in a small freezer bag and seal. Set aside. Turn the cake onto a 10” cardboard round and peel off the parchment paper. Top the cake with the chopped Reese’s cups. Place in the OFF oven for 3 to 4 minutes, enough time to let the peanut butter cups melt a bit. Remove from oven. 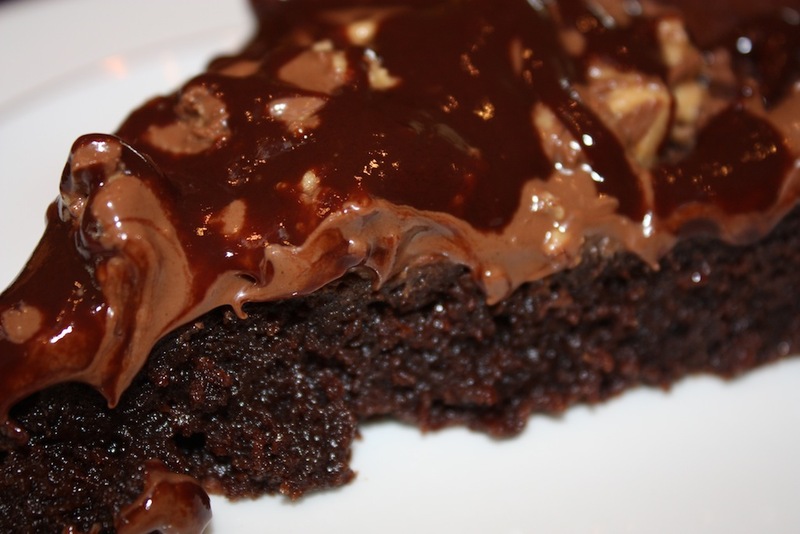 Cut a corner of the freezer bag and squeeze the chocolate topping on top of cake. Chocolate Peanut Butter Explosion may be made ahead of time. Top with the chopped peanut butter cups, but not the chocolate topping. Rewarm in an oven until you see the peanut butter cups melting a bit. Remove from oven and drizzle with the chocolate topping. Absolutely awesome. One of the most amazing desserts I’ve ever looked at and tasted. First of all it was a thing of beauty. I could not believe that my finished product actually resembled yours. And that fudge brownie, topped with the melted Reese’s and chocolate? What a combination! It, literally, just melts in your mouth. This was one of your most unique creations. I would never in a million years have tackled something like this, had it not been for your step by step pictures that just make your detailed written instructions so easy to understand and follow. Thanks so much. Thank you so much for your comments! I love the feedback. this was so good i couldnt believe how the ingredients blended perfectly and im not known for my sweet tooth, but i think im growing one.